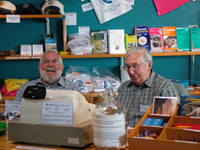 There are many ways in which you can volunteer at the Centre by becoming a Working Friend: you may be retired and looking for a few hours to help while away the time; looking for volunteer experience as a recent graduate; or just have an interest in the great outdoors. Click here to download a Friends’ leaflet and join today! Detailed below are broad categories of the opportunities we have to offer, if you feel that you have skills that would be of benefit in other ways then please contact us. The Centre is open from 10.30am – 4.30pm every day from Easter to October, and Friends also help out on weekends over the winter period. Sessions behind the desk are three hours either in the morning (10.30am – 1.30pm) or in the afternoon (1.30pm – 4.30pm). You can choose a time, or times that suit you best with a rota organised every two months. You don’t have to be an expert in regard to fossils and geology, a warden is always on hand to answer questions from visitors, but if you would like to learn more, then we are happy to teach you. The Centre runs a comprehensive programme of events all year round, with the busiest times being of course, the school holidays. Volunteers assist the Warden team on a wide range of events from fossil hunting walks and rockpool rambles to art and craft sessions based in the Centre. All events and walks are Warden led, as a volunteer you are there to provide assistance to the Warden in charge. No previous knowledge of fossils or marine life is needed. The Centre also runs an annual art exhibition and volunteers are always needed to assist with this event. The Centre welcomes over 5,000 school children on organised visits to the Centre and beach every year. The main bulk of these visits are from primary schools, with many of the children arriving at the beach hoping to find their very own Tyrannosaurus Rex to take home! Their enthusiasm for finding a fossil on the beach or crab in the rockpools knows no bounds. Each school group is led by a member of the Warden team but volunteers play an important role in helping with the groups out on the beach areas. During the winter the volunteer working party carry out essential maintenance work in the Centre in order to be ready for the next season of visitors and schools. All that is needed is a few basic DIY skills and an appetite for cups of tea and chocolate biscuits. Being an independent charity, the Centre is always on the look out for funding for projects. If you have any expertise in this area or are just a willing pair of hands, help is always very much appreciated. The Centre likes to keep a comprehensive gallery of photographs for use in publicity and displays, but the wardens are often too busy leading the events and activities that they don’t have time to take the photographs! Alternatively, if you have any photographs that you think may be of use to the Centre or would like to help catalogue our current image bank, then please contact us. Committee work plays an important role in the Friends organisation but takes just a few hours a year. Click here to download a Friends Membership form and return it to the Centre.